Download "Striving for Success: Teacher Perspectives of a Vertical Team Initiative"
3 LISA BERTRAND, RUTH ANN ROBERTS, AND ROBERT BUCHANAN 3 members must foster a sense of communication with other colleagues that may not be involved with the vertical team initiative. 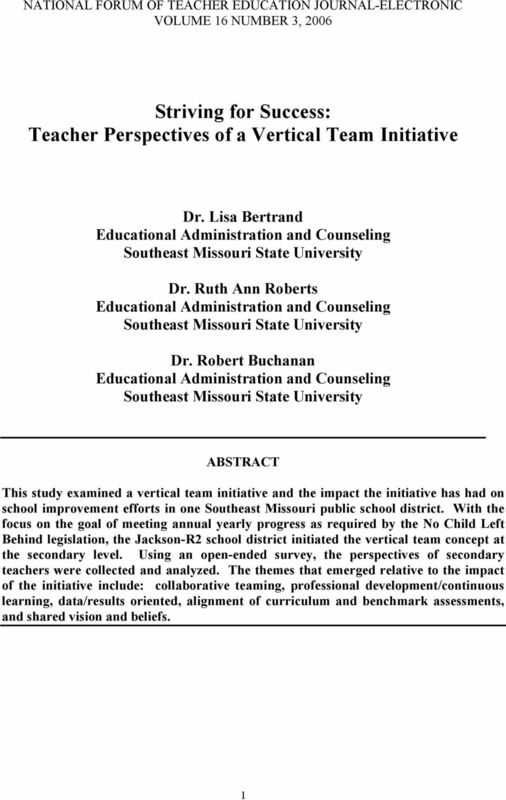 Based on the theoretical framework, a study was designed to examine teacher perspectives and to understand the impact of the vertical team initiative in one school district located in Southeast Missouri. In order to understand the context of the study, a description of the school district, participants involved in the study, and test information is provided. 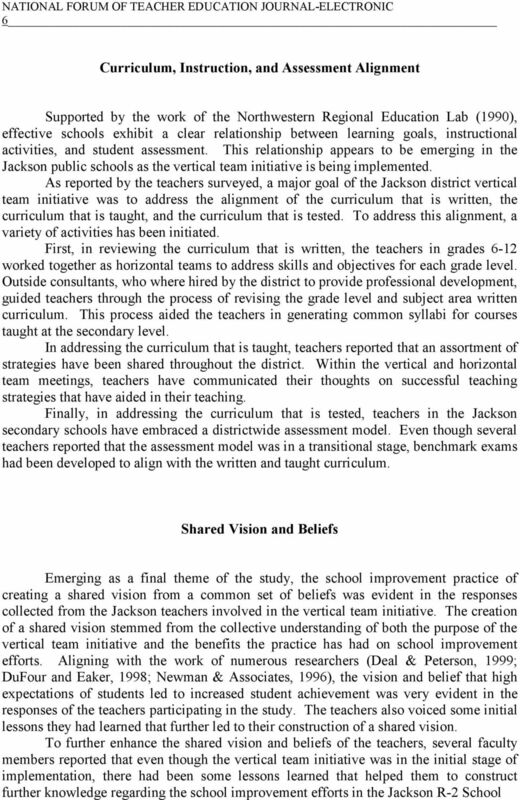 School District Description and Participants Beginning in the school year, the Jackson R-2 school district in Jackson, Missouri, implemented the vertical team concept as a means to improve student achievement. Vertical team coordinators were selected for each of the core subject areas and during the summer of 2003, vertical team meetings were held in order to address a variety of tasks. The teams researched sound instructional strategies, studied previous test data, and worked together to develop course syllabi and benchmark tests. The course syllabi and the benchmark tests were aligned with the state developed grade level expectations for each subject area. The school district is located in Jackson, Missouri and has a total school population of approximately 4600 students in kindergarten through grade 12. The demographic data reflects that approximately 97% of the population is white, 2% of the population is Black, and the remaining 1% of the population is Asian, Hispanic, or Indian. Twenty-four percent of the population receives free or reduced lunches. In Missouri, the state mandated test is the Missouri Assessment Program (MAP). Communication Arts is tested in grades three and seven, with Mathematics tested in grades four and eight. Students are rated in four categories which include advanced, proficient, progressing and Step 1. To determine Annual Yearly Progress (AYP) numbers are reported for the Advanced and Proficient categories. Test data indicate an improvement in student achievement in that more students are attaining the advanced and proficient rating which also reflects that the number of students meeting AYP is increasing (Missouri Department of Elementary an Secondary Education, 2004). The population for this study consisted of 63 teachers. Of these teachers, 26 teachers were assigned to Jackson High School (grades 10-12), 18 teachers were assigned to Jackson Junior High School (grades 8-9), and 19 teachers were assigned to Jackson Middle School (grades 6-7). When divided into vertical teams, 11 teachers were members of the communication arts team, 18 teachers were members of the math team, 19 teachers were members of the science team, and 15 teachers were members of the social studies team. Participants were asked to complete an open-ended survey questionnaire that included ten questions. 4 4 Method This project employed a research design involving survey research. An initial interview was scheduled with the assistant superintendent of personnel and instruction to obtain additional information relative to the vertical team concept implemented in the Jackson R-2 schools. From information obtained during the interview, a 10 question open-ended survey was developed (Neuman, 2000; Creswell, 2002). Areas addressed included training, curriculum alignment, instructional strategies, assessment models, evaluation of the initiative, and lessons learned from the implementation. Using within-subject analysis, categories were developed to document the teachers perspectives. Cross-grade analysis was then used to determine emergent themes (Strauss & Corbin, 1998). Results and Emergent Themes In analyzing the data, five themes emerged relative to the impact of the vertical team initiative. These included: professional development; collaborative teaming; data/results oriented; alignment of the curriculum that is written, curriculum that is taught, and curriculum that is tested; and a sense of a shared vision and belief system. Professional Development As a school improvement practice, the teachers in the Jackson public schools were committed to continuous learning as a means toward achieving student success and building teacher capacity. Kushman and Chenowith (1996) supported this idea as they suggested that building teacher capacity was the key to accelerating the learning for all students. The vertical team initiative has been implemented in the Jackson public schools over an extended period of time with professional development activities occurring on a year round basis. Teachers have attended sessions during the school year on days set aside for professional development and during the summer months. Outside consultants have been utilized to provide training in the process of vertically aligning curricular objectives. The majority of teachers perceived the idea of professional development as a means of continuous learning as they worked toward accomplishing their goals. 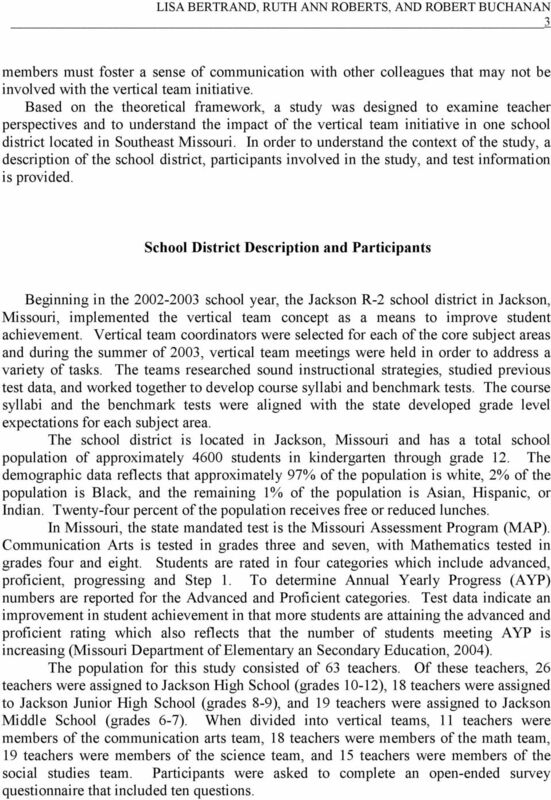 The goals set by the Jackson school district continue to be addressed with teachers meeting in vertical teams to study the alignment of subject curricular objectives with the Missouri state grade level expectations, to discuss the results of the benchmark assessments and how this data aligns with the current MAP scores, and to develop course syllabi. 5 LISA BERTRAND, RUTH ANN ROBERTS, AND ROBERT BUCHANAN 5 Collaborative Teaming Collaborative teaming, viewed as a school improvement practice to help meet the challenges of the federal and state accountability measures, was a focus of the teachers in the Jackson public schools. Secondary teachers in the Jackson R-2 schools viewed the vertical team initiative as a collaborative effort to improve student achievement. Overwhelmingly, the teachers reported that collegiality had improved due to the focused effort regarding the concept of teaming. As reported by a high school math teacher, Collegiality has increased dramatically; communication has improved and we have identified weak areas in our curriculum. By meeting both in horizontal and vertical teams, the teachers stated that they were able to build on each other s strengths as they shared ideas and strategies they were using in the classroom. In the collaborative team meetings, teachers reported that they were able to discuss a more uniform manner of instruction that led to more uniform assessments of student achievement. Striving to meet a common goal was a thread that was interwoven through a majority of the responses. As one-sixth grade science teacher reported, We sixth grade science teachers are more helpful and have a common goal. In grades 6-12, we are closer and also have a common goal. It is the best thing that s happened! 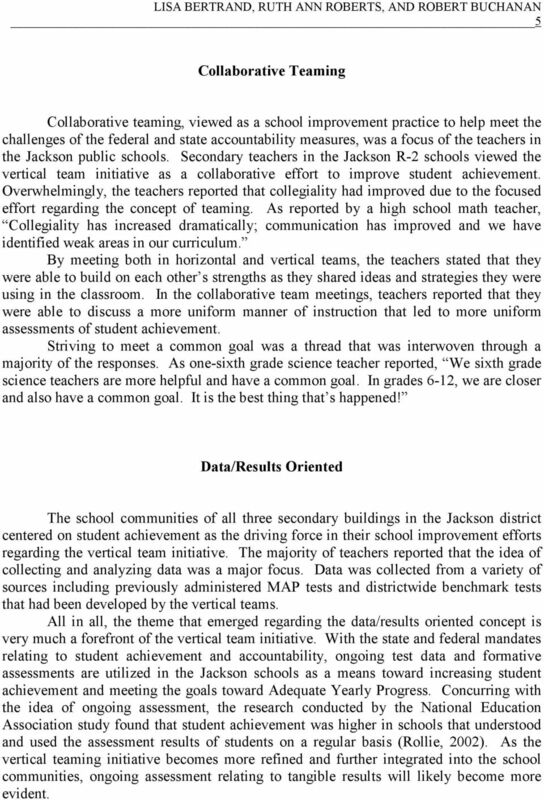 Data/Results Oriented The school communities of all three secondary buildings in the Jackson district centered on student achievement as the driving force in their school improvement efforts regarding the vertical team initiative. The majority of teachers reported that the idea of collecting and analyzing data was a major focus. Data was collected from a variety of sources including previously administered MAP tests and districtwide benchmark tests that had been developed by the vertical teams. All in all, the theme that emerged regarding the data/results oriented concept is very much a forefront of the vertical team initiative. With the state and federal mandates relating to student achievement and accountability, ongoing test data and formative assessments are utilized in the Jackson schools as a means toward increasing student achievement and meeting the goals toward Adequate Yearly Progress. Concurring with the idea of ongoing assessment, the research conducted by the National Education Association study found that student achievement was higher in schools that understood and used the assessment results of students on a regular basis (Rollie, 2002). As the vertical teaming initiative becomes more refined and further integrated into the school communities, ongoing assessment relating to tangible results will likely become more evident. 8 8 and that the benchmark tests were a means to gather formative data throughout the school year. Professional development was viewed as a key to success. Overwhelmingly, the faculty in the Jackson secondary schools is committed to making difference in the lives of the students they teach. 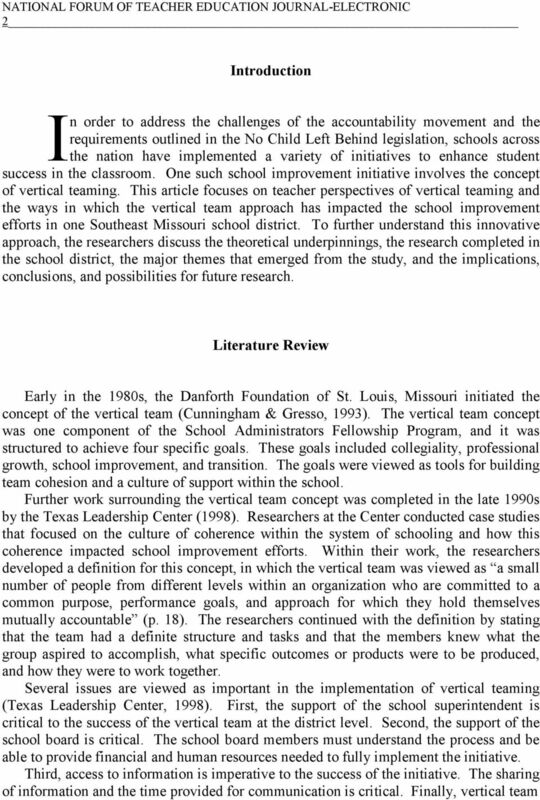 Implications This study contributes to the understanding regarding the collaborative vertical team initiative and the impact it has had on school improvement efforts. The findings of this study are consistent with the literature regarding how schools can react to the challenges of improving student achievement and meeting their Adequate Yearly Progress goals. School improvement efforts require a collaborative effort. With this in mind, the following implications are presented. District Level. As districts develop their plans for improvement, areas involving curriculum, instruction, and assessment must be addressed. 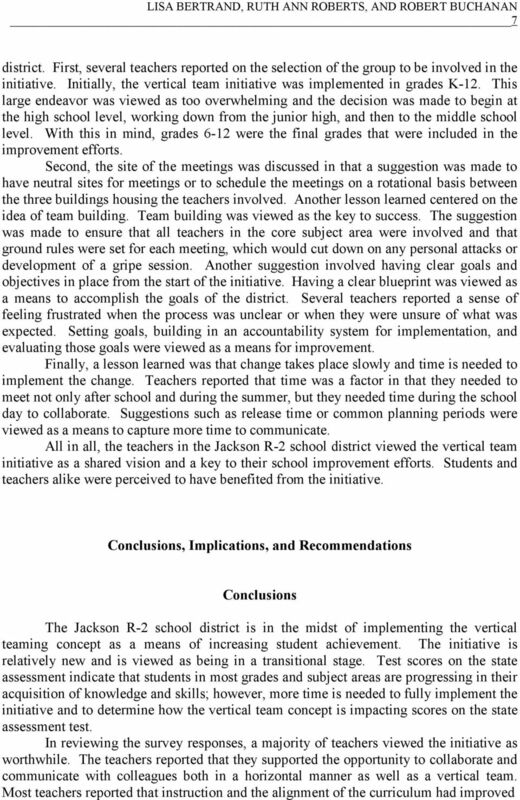 District support of the vertical team initiative was evident in the study of the Jackson R-2 school system. Support was evident in professional development activities offered to teachers. Teachers were involved in training and team building activities that enhanced their understanding of the improvement process. Curriculum is being aligned both horizontally and vertically and a districtwide assessment model is being implemented in grades Preservice Level. Preservice programs for teachers must strive to teach future teachers best practices involving school improvement efforts. In the era of state assessments and accountability, new teachers to the field must be able to collect data, disaggregate data, and analyze data. Preservice teachers need to be aware and understand what it takes to collaborate and to make decisions as a team. They must also be able to align their instructional practices to state standards and to formatively assess students as means of improving student achievement throughout the school year. Finally, preservice teachers must understand that continuous learning is a process that will enhance their teaching and that professional development is needed on an ongoing basis throughout their career. 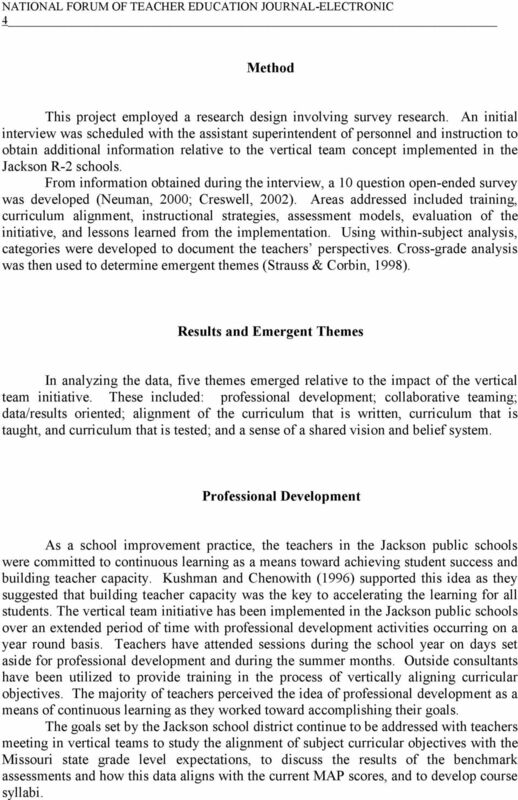 Recommendations for Further Studies From the findings of this study relative to the impact the vertical team initiative currently being implemented in the Jackson R-2 school district, further questions have emerged. First, the reporting of other voices would help to validate this study. Questions pertaining to the perceptions of administrators (both building and district level), parents, and students have come to mind. The perception of these people could provide additional details regarding the vertical team initiative and the school improvement process. 9 LISA BERTRAND, RUTH ANN ROBERTS, AND ROBERT BUCHANAN 9 Another recommendation involves the Missouri Assessment Program. The state assessment model has not previously included a test of the language arts and math areas every school year. However, beginning in the spring of 2006, Missouri will implement a new testing model to reflect the changes mandated by the No Child Left Behind Act. This new model will include the assessment of both the language arts and math areas in grades three though eight. It will be of interest to educators to determine how this new assessment program will impact district improvement practices. Finally, since the vertical team initiative is in the beginning stages of implementation in the Jackson schools, a follow-up study would provide information on a longitudinal basis. 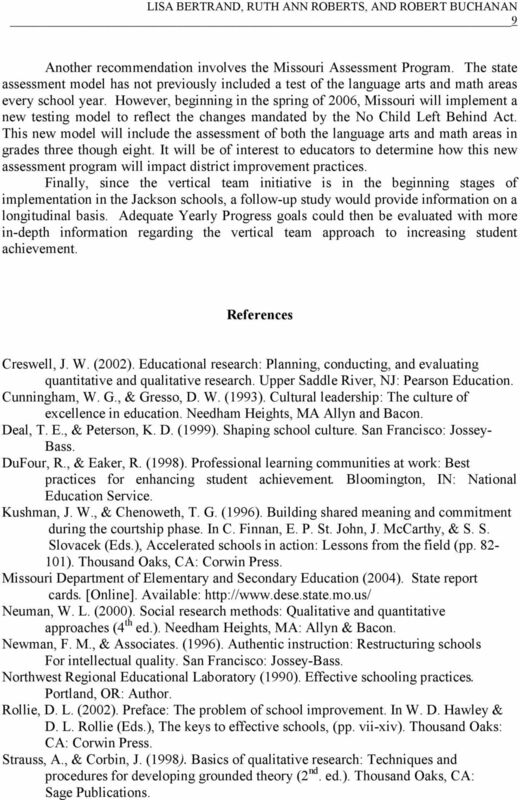 Adequate Yearly Progress goals could then be evaluated with more in-depth information regarding the vertical team approach to increasing student achievement. References Creswell, J. W. (2002). Educational research: Planning, conducting, and evaluating quantitative and qualitative research. Upper Saddle River, NJ: Pearson Education. Cunningham, W. G., & Gresso, D. W. (1993). Cultural leadership: The culture of excellence in education. Needham Heights, MA Allyn and Bacon. Deal, T. E., & Peterson, K. D. (1999). Shaping school culture. San Francisco: Jossey- Bass. DuFour, R., & Eaker, R. (1998). Professional learning communities at work: Best practices for enhancing student achievement. Bloomington, IN: National Education Service. Kushman, J. W., & Chenoweth, T. G. (1996). Building shared meaning and commitment during the courtship phase. In C. Finnan, E. P. St. John, J. McCarthy, & S. S. Slovacek (Eds. ), Accelerated schools in action: Lessons from the field (pp ). Thousand Oaks, CA: Corwin Press. Missouri Department of Elementary and Secondary Education (2004). State report cards. [Online]. Available: Neuman, W. L. (2000). Social research methods: Qualitative and quantitative approaches (4 th ed.). Needham Heights, MA: Allyn & Bacon. Newman, F. M., & Associates. (1996). Authentic instruction: Restructuring schools For intellectual quality. San Francisco: Jossey-Bass. Northwest Regional Educational Laboratory (1990). Effective schooling practices. Portland, OR: Author. Rollie, D. L. (2002). Preface: The problem of school improvement. In W. D. Hawley & D. L. Rollie (Eds. ), The keys to effective schools, (pp. vii-xiv). Thousand Oaks: CA: Corwin Press. Strauss, A., & Corbin, J. (1998). Basics of qualitative research: Techniques and procedures for developing grounded theory (2 nd. ed.). Thousand Oaks, CA: Sage Publications. 10 10 Texas Leadership Center. (1998). Vertical teaming: Connections for a coherent system. Austin, TX: Author. Summary of the Practice. The focuses on strengthening the capacity of leaders and teachers to implement an instructional support model to continuously improve teaching and learning in Texas classrooms. Case Study Chula Vista, California Summary: (CVESD) uses LAS Links to measure the language proficiency of English language learners (ELLs), monitor student progress, and inform instructional decisions. WHAT ARE THE INTERVIEW QUESTIONS MOST FREQUENTLY ASKED BY BOARD OF EDUCATION MEMBERS? Summary of Study and Findings J. Lisa Stewart, Ph.D.
Strategies to Improve Outcomes for High School English Language Learners: Implications for Federal Policy A Forum. Sample Superintendent Goals Example 1: The parties agree to the following goals during the term of this agreement: At least twice a year, the Superintendent shall report on his progress on the goals. 1.